We are excited to release the new 6.5 update for Silverstack and Silverstack Lab. 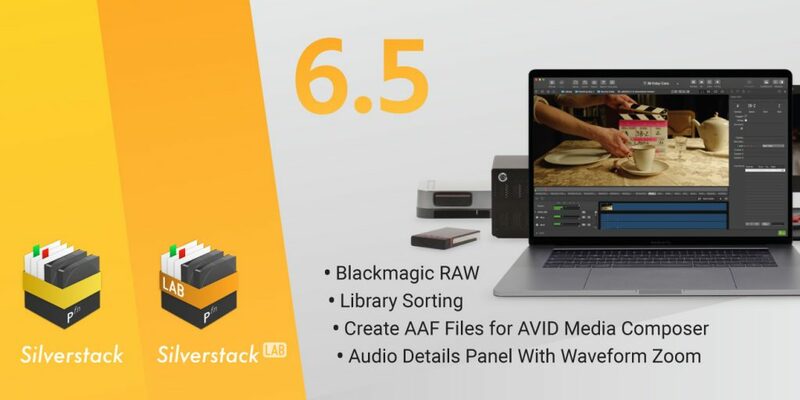 Blackmagic RAW and Codex HDE: Advanced camera support for Blackmagic RAW and Codex HDE ARRIRAW files (.arx). Custom naming options for stills and reports: Use the familiar metadata wildcards to automate file naming of exported stills and reports. Alphabetic library sorting: Choose to sort bins and folders by name or date in order to get a better overview of your library content. Custom keyboard shortcuts: Define your individual shortcut for any action in the main menu. You can find a comprehensive list of all new Silverstack features here. AAF files for Avid Media Composer: Speed up and simplify editing workflows in Media Composer by creating AAF files. Audio waveform zoom: Zoom into the waveform of audio tracks using the new audio details panel, and review audio sync visually. You can find a comprehensive list of all new Silverstack Lab features here.